Creating The Any Age Anywhere Garden, A Small Space With Big Yields! Every year, we like to try a few new garden experiments at the farm. Some flame out, others hold their own – and every once in a great while, one leads to something really new and exciting. 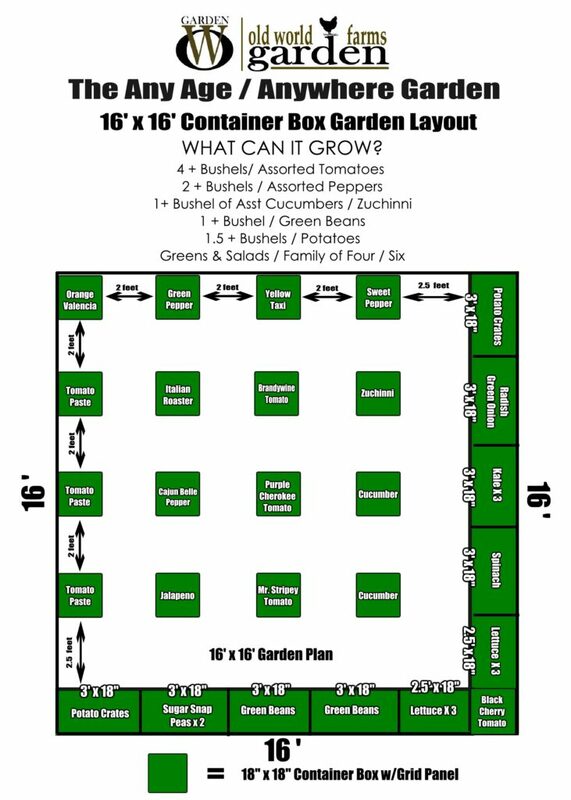 In the case of last year’s tomato bucket and potato crate trials (see: The Tomato Bucket, Growing Crate Potatoes) – it worked so well we are creating a brand new 16′ x 16′ experimental container garden at the farm for 2016! One that we will call our Any Age Anywhere Garden. Today we’ll cover the overall garden set-up and layout, and next week – the details on how to build your own. Why the name? Because it’s truly a great way for anyone, of any age, living anywhere, to grow some, most, or nearly all of their family’s food. Even when space is limited! As much as we talk about the beauty, simplicity and ease of raised row gardening (see : Raised Row Gardening Basics), – we realize that not everyone has the room or ability to grow with that style. We receive emails from all over the world asking for alternative gardening methods for those with small yards, patios, or others that might have trouble turning the soil over or bending down to tend rows of crops. Over the last two years – in addition to the main garden at the farm – we experimented on a small scale with a few traditional container gardening methods – and then adding in some tricks and methods we use in our own garden ( like the Stake-a Cage) to see what we could create. The goal was simple. Design an attractive, inexpensive and functional container garden that anyone of any age could plant. It needed to be simple to create, maintain and harvest – and conserve on space. It also of course had to produce enough that you could grow some serious food! Last year, we trialed tomato bucket containers. We built wooden frames with scrap lumber that went over the top of 5 gallon buckets or nursery containers. 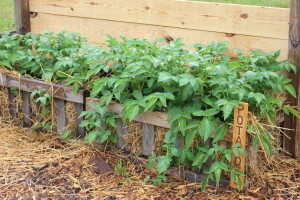 We then attached a 4’ high x 16” wide wire frame to the inside of the wooden frame for a built-in, heavy-duty trellis. It was a take off of the Stake-A-Cage that we use in our main garden – and it worked incredible – all at a cost of about $2 for the wire trellis. If needed – we could have even made that from scrap lumber for free. 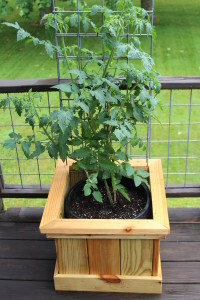 The higher level bucket allowed for easy watering and maintenance.By screwing in the trellis to the box – it provided a perfect support for the tomato that was easy to reach and tie up the plant as it grew. The bucket provided more than enough room to establish a deep and complete root system – and the cover not only made the planter attractive, but helped to insulate the plant’s base from harsh winds and helped to conserve water. It also made harvesting a breeze. BEST of all – it all but eliminated weeding and ground pests like slugs. It also stopped potential damage from voles, moles and rabbits – a problem many of you write to us about each year! And with its compact space – it even made it easy to protect from raccoon and deer. The same can be said for our potato crates. Our potato crates were a big success!!! Growing a lot of potatoes in a small space. So we decided – why not design an entire garden around this concept? After all – it can be built anywhere – a patio, a small backyard – or even in the middle of a garden. We settled on a 16′ x 16′ “garden” space using the buckets for planters – and then filling in the edges with simple raised beds for salads, potatoes and greens. What you have is a small space garden that can produce! 4 + Bushels/ Assorted Tomatoes , 2 + Bushels / Assorted Peppers, 1+ Bushel of Assorted Cucumbers / Zucchini, 1 + Bushel / Green Beans, 1.5 + Bushels / Potatoes – and Greens & Salads that can easily feed a family of four to six, with some to give to neighbors and friends! Not bad for a small space garden! In addition to trialing the garden at our farm – we will have a 16 x 16 Any Age Anywhere Garden on display in the Weaver Barns Urban House Area at the Great Big Home + Garden Show in Cleveland Feb 5th through the 14th. We will be sure to share pictures of the set up on a future Farm Update. Next week – we’ll cover the process of building the planter boxes, growing crates, and laying out the garden. 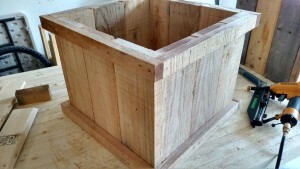 One big advantage – since the soil nor plants never come in contact with the wood – you can use reclaimed lumber or pallets to build your boxes – so for a resourceful person – they can be made for little or no cost! ← Homemade Crackers – Made With Just 3 Ingredients!